Powers/Abilities: Pheragots have an extremely dense molecular structure which has granted them superhuman strength (class 50-100?). They are known as the strongest race in the Andromeda galaxy. Cultural traits: Some factions are bellicose, willing to commit genocide against an entire race if that race's leaders have somehow harmed the Pheragot race. History: (Silver Surfer III#32) - When the Silver Surfer was driven mad by an infection given him by Mephisto, he assaulted and destroy a Phergot refinery which was in orbit of the planet Ryas. At Arago-7, a Phergot named Anthos detected the disappearance of the refinery, and the Pheragots prepared to investigate, dispatching a ship commanded by captain Kerjos. Arriving at Ryas, they found the debris of the refinery and a surviving holo-recorder revealed the Silver Surfer to be the one who destroyed the facility. The exploratory team was then ordered to find the Silver Surfer and determine why he had destroyed the refinery. They found the Surfer in an asteroid belt, attacking empty air in his madness. They were able to bring the Surfer aboard their ship and determined he was suffering from Hlavac's disease. Before they could treat him, the disease took hold of the Surfer again and he tore through the ship. Fortunately, captain Kerjos had separated the Surfer from the body of the ship, so they suffered no casulties. The Pheragots sent out a distress message to warn others of what had happened, but the Surfer was ultimately able to cure himself. (Cosmic Powers Unlimited#4 - BTS) - The M'Ndavians race was wiped out through a plague created by agents of the Axi-Tun Lord Votan. Votan had his agents make it seem as though the Pheragots were responsible. (Cosmic Powers Unlimited#5) - Intent on avenging themselves, a Pheragot vessel journeyed to Tun to wipe out all life on the planet, despite the wishes of the Charter, and the attempt by the Star Masters to extract Votan. Although their initial assault succeeded, future missiles were prevented from falling on the planet due to the intervention of the Star Masters, and the Pheragots were forced to stand down. (Annihilation: Silver Surfer#2) - A Pheragot was taken captive by the Annihilation Wave and presented to its leader, Annihilus. 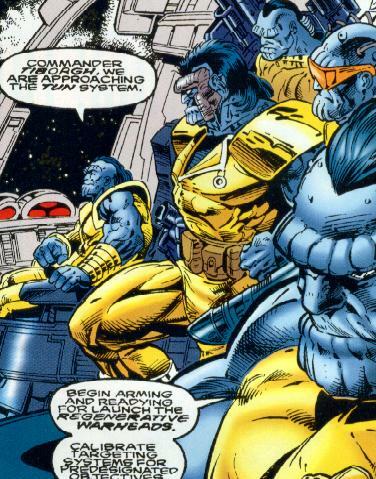 (Wolverine: The Best There Is#9) - A Pheragot served in General Kosrrouschah's crew alongside a P'tah and a Scatter. They went after after Monark Starstalker and Paradox, who had allied with Wolverine. Monark slew the Pheragot with a sword. Comments: Created by Bob Layton. Although the Pheragots were described as "the kindest, gentlest beings in the universe" in the 2200 timeline, that certainly didn't seem to hold true when we saw them in the regular timeline. Possibly they underwent massive changes in the following 200 years? In Galacta: Daughter of Galactus#1, Galacta consumed some Pheragots. I would not think the character and stories in Galacta are part of Reality-616, but that has yet to be definitively confirmed anywhere. For the record, around that same time, she also feeds on some Badoon, H'ylthri, Kosmosians, Tribbites, Shi'ar, Tektons, Herms, Aedians, Laxidazians, Centaurians, A'askvarii, Flb'dbi, Ul'lula'ns, and R'malk'i. 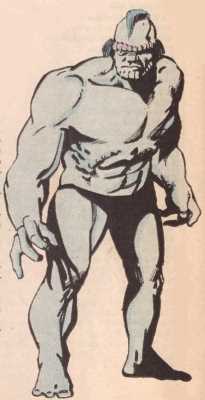 Thanks for the additions of the Official Handbook of the Marvel Universe information and images courtesy of Donald Campbell. (Hercules: Prince of Power I#1) - At the Starharbor at the planet Petocco, the demi-god Hercules beheld a Pheragot entering the bar he was currently carousing in. When another patron mentioned that Pheragots were the "strongest creatures in the galaxy", Hercules set after the alien to challenge him in battle. Hercules struck the massive alien in the chest, whereupon he fell over and sobbed, "W-what did I d-do to make y-you hate m-me?" Hercules was then informed that Pheragots were the kindest, gentlest beings in the universe. The other bar patrons drove Hercules out of the bar for his behavior.